So on my blog shoot today, I felt like a princess. This was because I was wearing the most beautiful dress I have ever worn. I was very luckily sent this stunning dress from Kayla at Jones and Jones. They make their dresses in their studio in London. As soon as it arrived, I couldn't wait to put it on! I had no make up on and my hair was stuffed up into a bun, but the dress made me feel a million dollars! I know it sounds corny, but it was the skirt, it has three layers of beautiful fabric, and it makes you want to twirl! Today was such good fun! I'm normally rushed and have 3 or 4 looks to shoot, but today, I dedicated it to the Kayla dress. I used one of my Valentine's day roses as I feel it needed a pop of colour and it was great fun adding a prop! I am travelling to a family wedding in Switzerland this April and I cannot wait to take it, everyone will be in love! Thanks again to the lovely guys over at Jones and Jones, I feel very lucky. 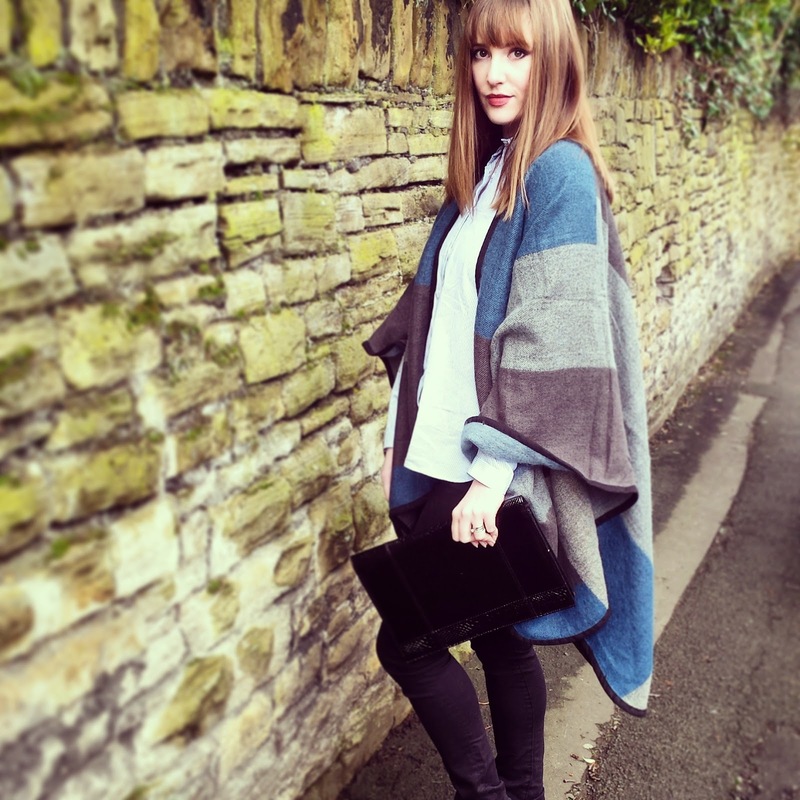 So I'm sure if you follow my instagram, or other bloggers, you will know that suede is going to be big this year! Not just for Spring/Summer, but as we've seen from London Fashion Week, it will still be seen everywhere in AW15. I'm a bit of a stickler when it comes to suede. It has to look amazing for me to like it. I don't naturally gravitate towards fabrics that can easily get stained/ruined as I am the worst for spoiling expensive things. However, this beauty from Asos just had to be mine! I luckily had 20% so the £65 price tag was significantly reduced, and therefore a must have (it's a sign when you get discount right?). It is just beautiful. I can't put in to words how great it looks in real life. The pictures don't do it justice! You have to feel the texture and see the quality of the stitching. If I don't somehow ruin it, the it's definitely a piece I could wear for years. 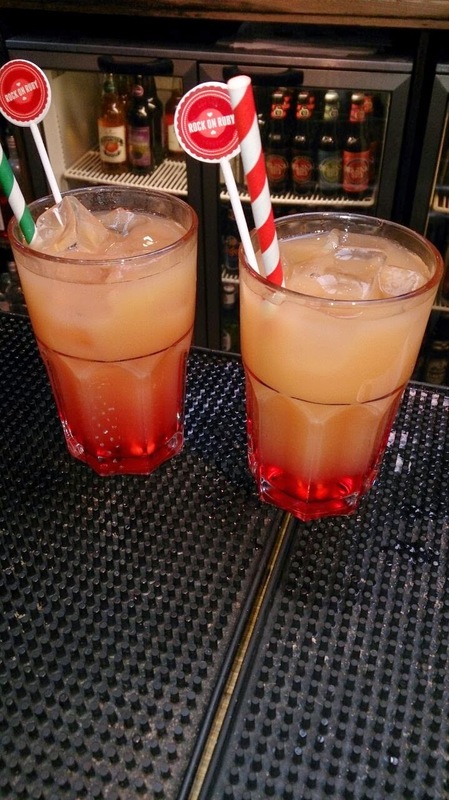 It also has a bit of fringing on it which keeps it very on trend, gotta love a tassel! 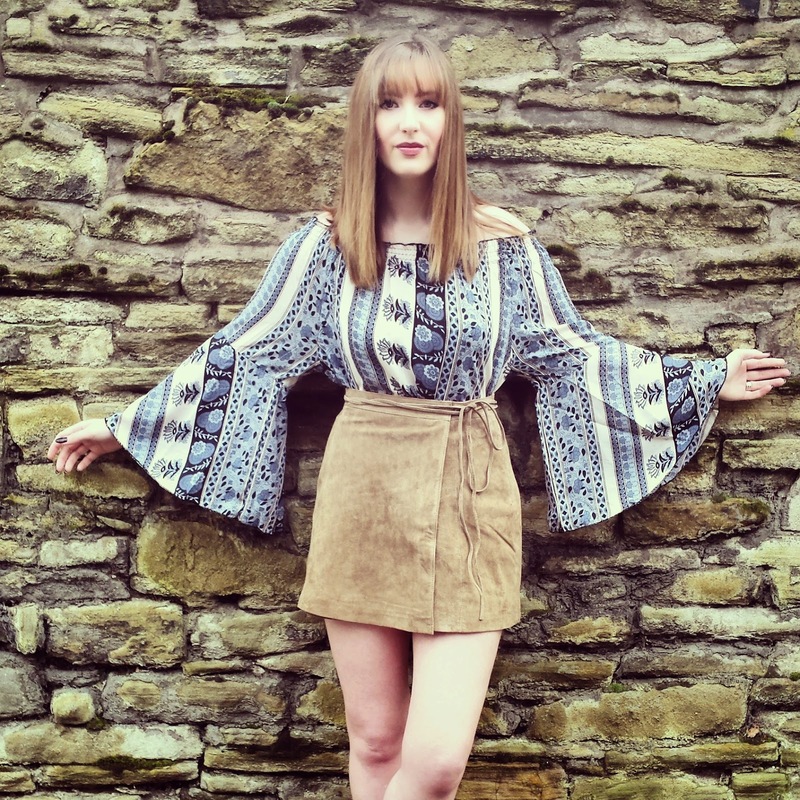 I went completely 70s mad and teamed it with this amazing flared sleeved boho top from boohoo.com. Although realistically I wouldn't usually wear this outfit with heels (I'd more likely team it with gladiator sandals), I thought they made it a bit more edgier and great for a blog shoot. How do you feel about suede? Love it or hate it, it's not going anywhere soon! 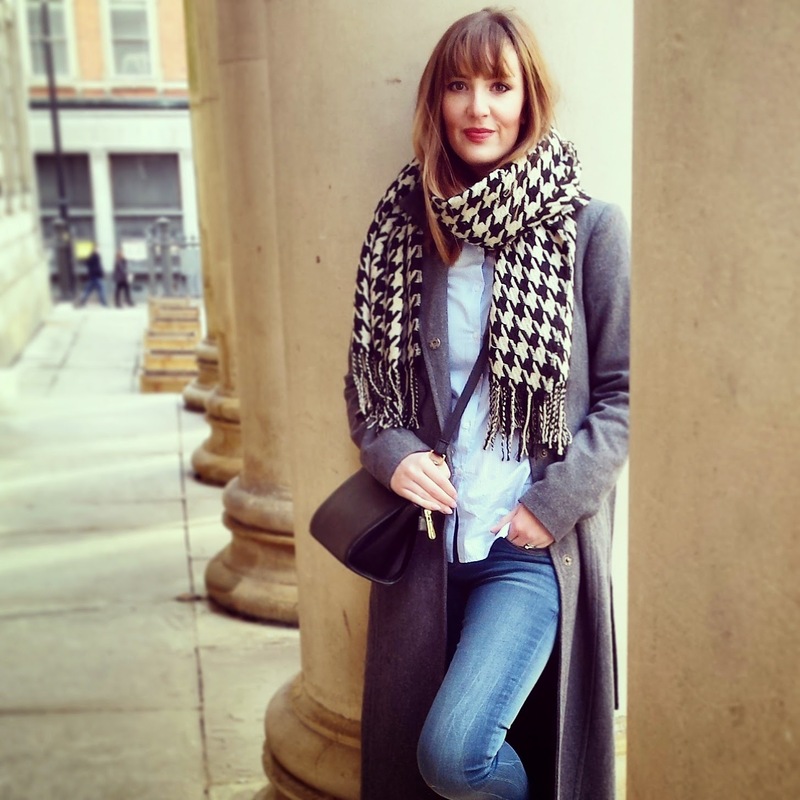 A few weeks ago, the lovely Alice contacted me asking if I would like to put together a day and night look featuring the upcoming brand Jailbird Jeans. I was obviously delighted to style them as they looked so great. I chose two pairs that I would get the most wear out of (I've lived in them ever since they arrived! ); some washed denim skinnies and a pair of black jeggins. Above is my day time look, however, I'm sure those of you who follow me on instagram will have seen many day time looks featuring this pair as they are so classic! They fit true to size, and grab all the right places. They are really flattering, but also comfortable; two things essential with any pair of jeans. 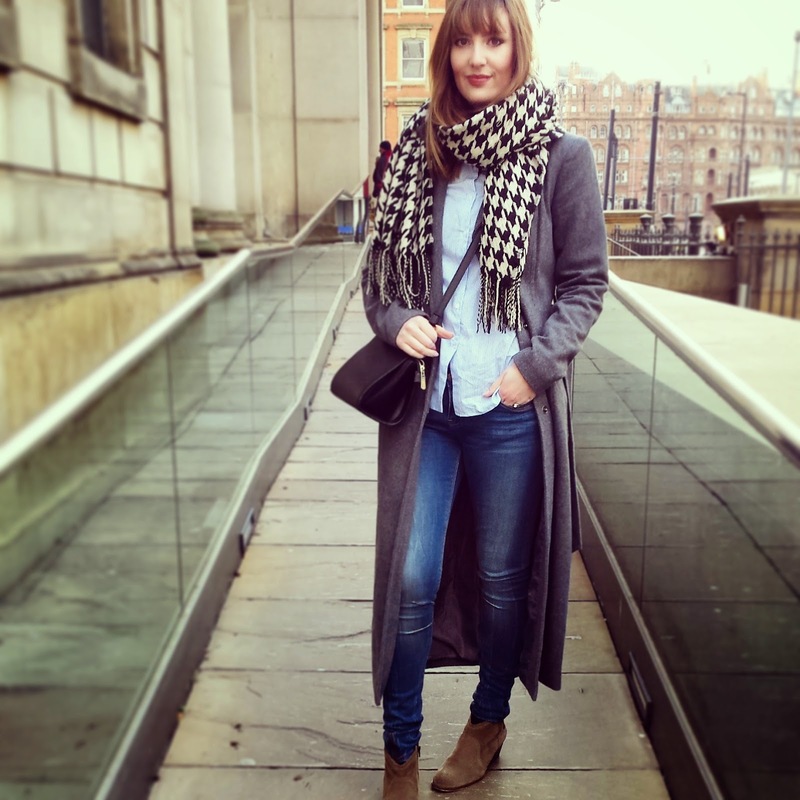 I went with the washed slim jeans, as although I love my mom jeans and occasional flares, I always go back to simple, wardrobe staple skinnies. 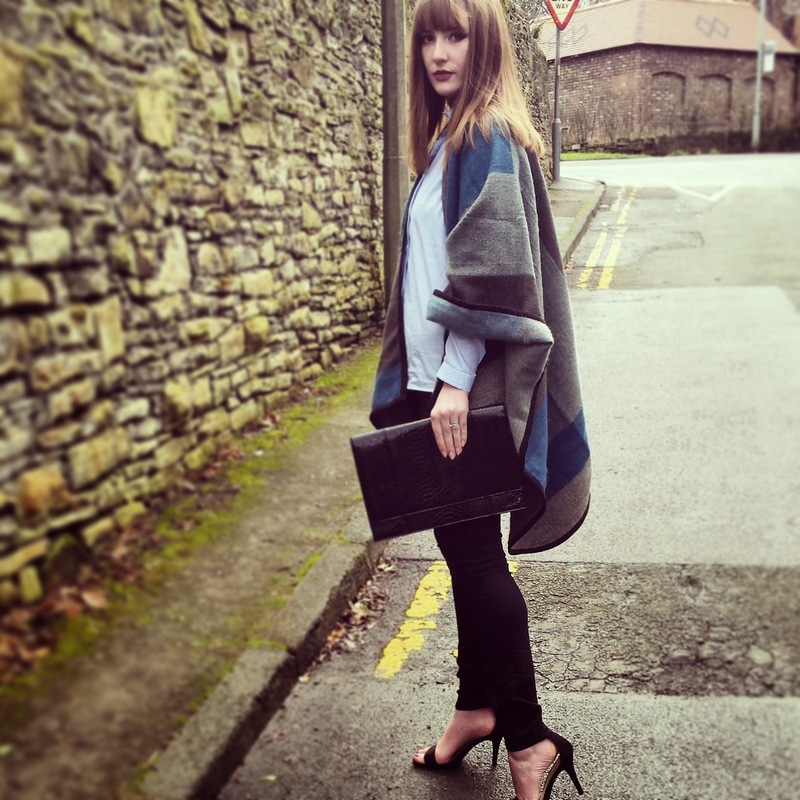 I teamed them with a simple striped shirt from asos, and my Vero Moda 'dressing gown' coat. I wanted to style a really wearable look for the night time. I took the basic Asos shirt and black jeggins as the base of the look, but then I jazzed it up by adding heels and my Boohoo cape. I absolutely love these jeggins! The are really slim fitting on the leg, which is great as they don't bag like some brands that I have worn in the past. They zip up at the back which leaves a great smooth band at the front with no bulky buttons pushing through. They have also kept their colour after several washes, something that is a well known problem with black denim! 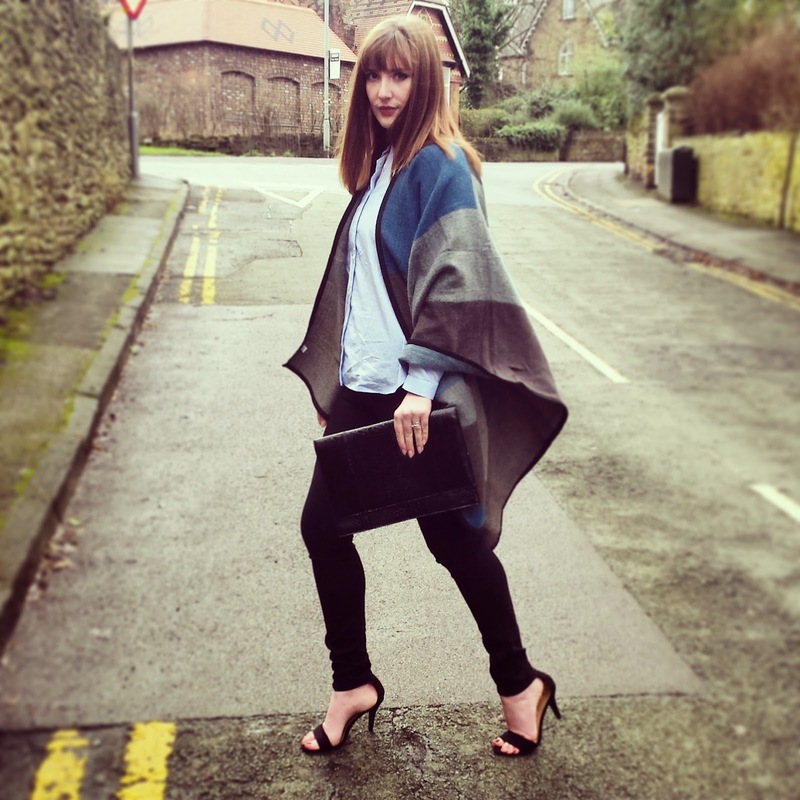 I'm still loving a good cape, and this beauty from boohoo has become a regular in my day to day looks. It's just so wearable and goes over so many different looks. It's also surprisingly warm! 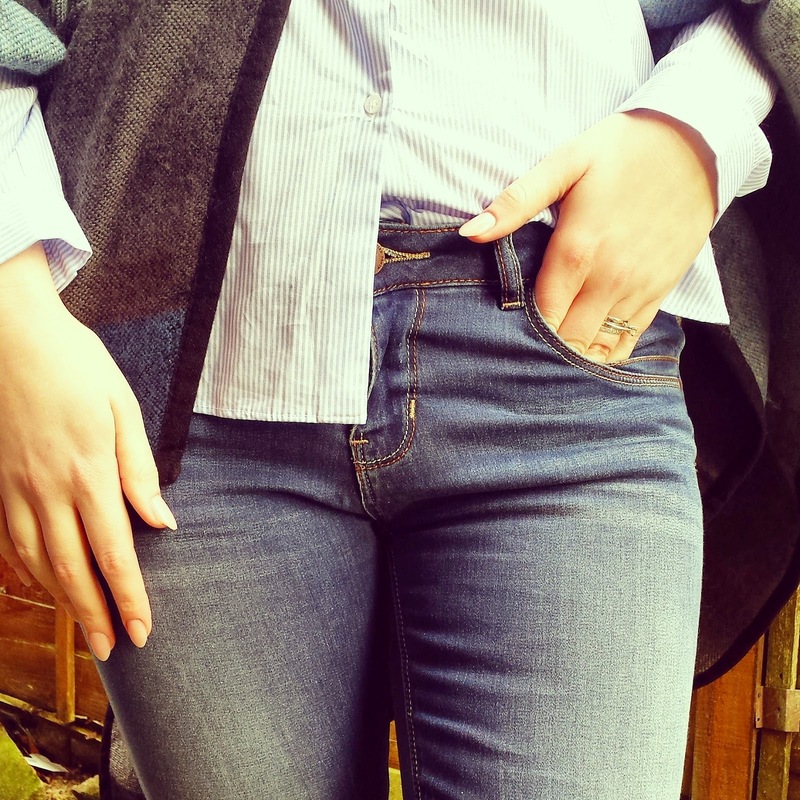 I hope you've like the way I have styled my Jailbird jeans, I'd defintitley reccommend them for style, comfort and to top it off they are really affordable! Anyway, on to the party; it was a clothes swap party! 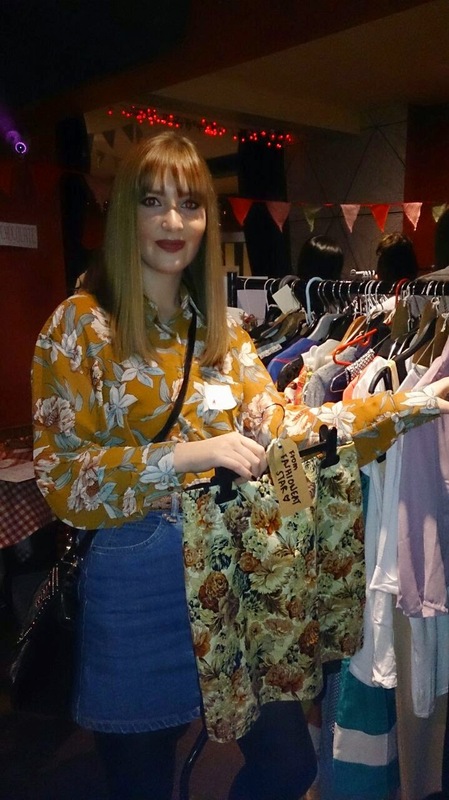 This entailed each blogger bringing a few items of clothing, accessories or unused make up that they no longer wanted, and swapping it with other blogger's unwanted things. Genius! It was like shopping...for free! It was also a chance to catch up with some friends and also meet some lovely new bloggers. 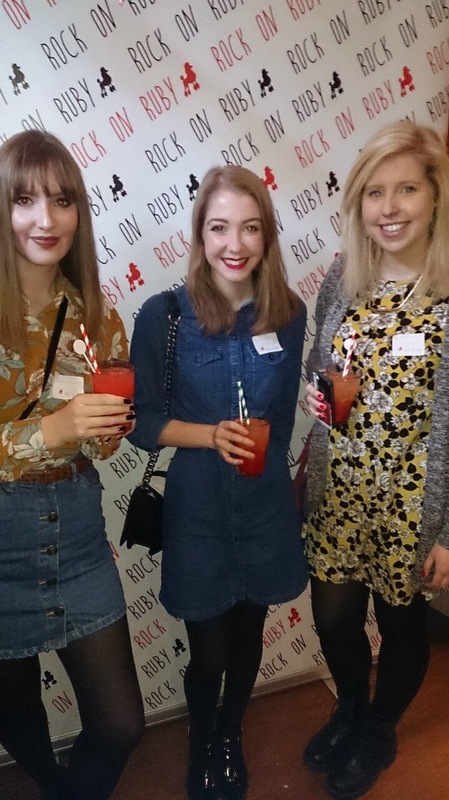 I saw the wonderful Gail from The Equinox Fashion, Laura from Fashion Eat Star and Anna from It's a Blogger's World. I also met lovely new friends; Stephanie, Ruth, Ashleigh and Melissa. A few of us were too busy drinking the fabulous cocktails that we missed the start of the swapping, but I still ended up with some fabulous things. My favourite was a vintage 70s style scarf from the lovely Alexandra from Champagne and Lemonade (pics to follow on Instagram). 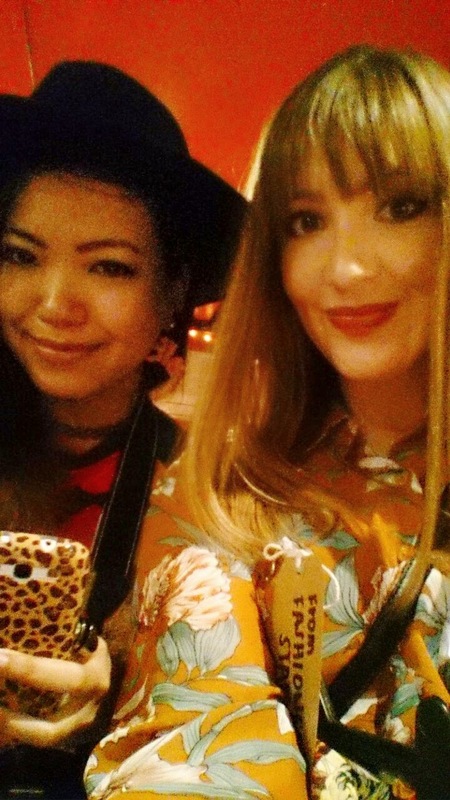 It was such a lovely way to spend an afternoon, shopping, cocktails and new friends. 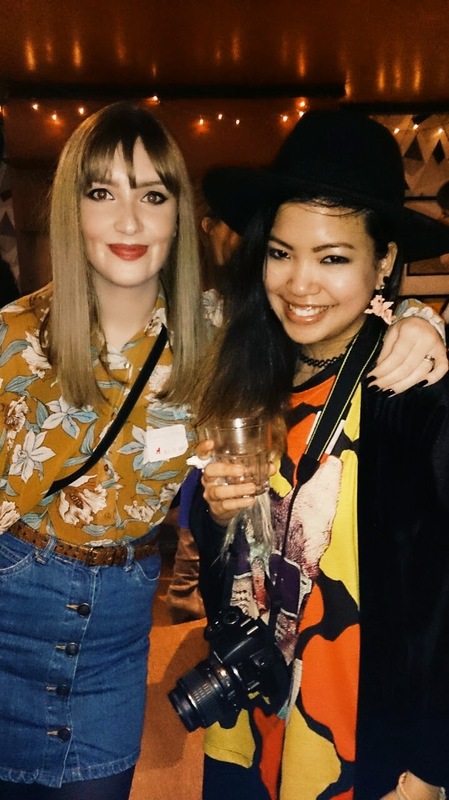 Can't wait to attend another clothes swapping party! 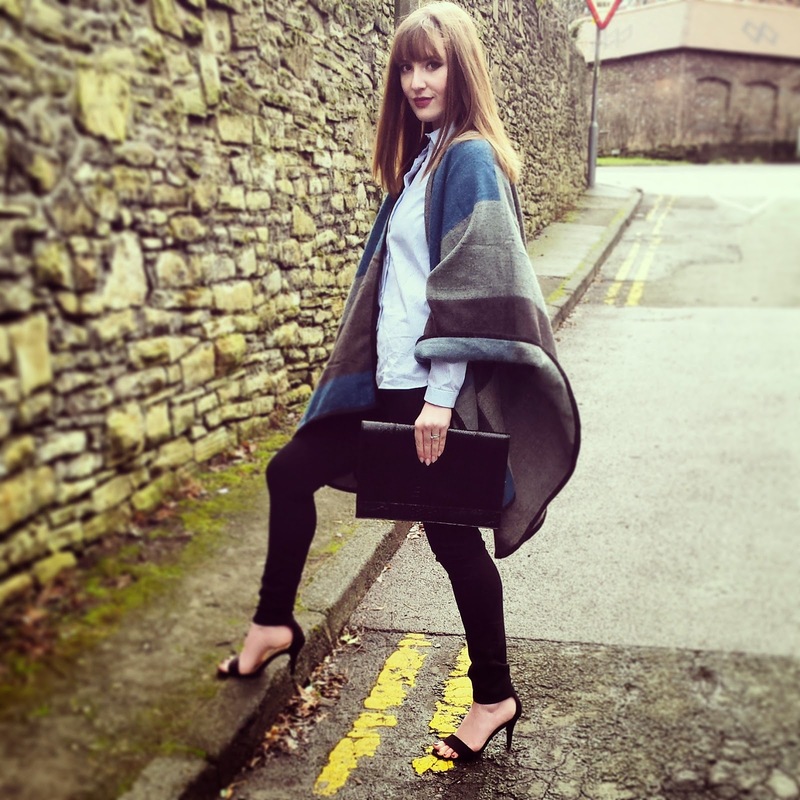 Today on the blog, I will telling you about a fantastic store that I have collaborated with! 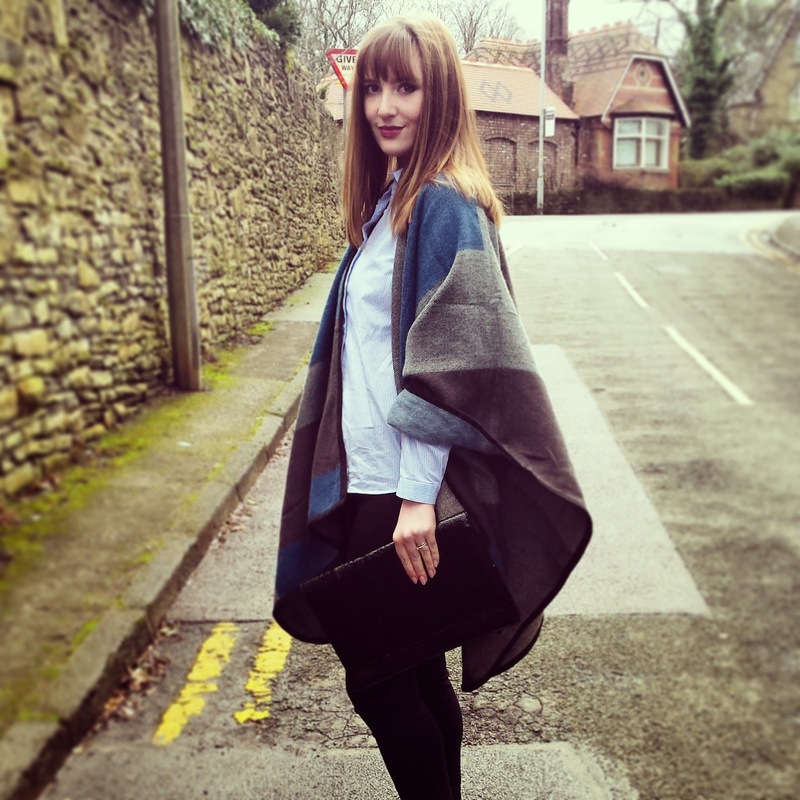 Gemini-Woman is a clothing boutique in the beautiful town of Stratford-Upon-Avon. Claire opened the store over 25 years ago, and due to the fantastic success, she has now branched out to an online boutique for customers to access the wonderful range of clothes who live all over the UK. Gemini-Woman stock a range of well known brands, including French Connection, Great Plains and Noa Noa. I was asked to choose some of the new SS15 pieces that I loved, believe me, to choose just a select few was hard, but I think you'll love the results! Look One features some wardrobe staples. A few items that can mix and match with anything and everything and will last for years to come. 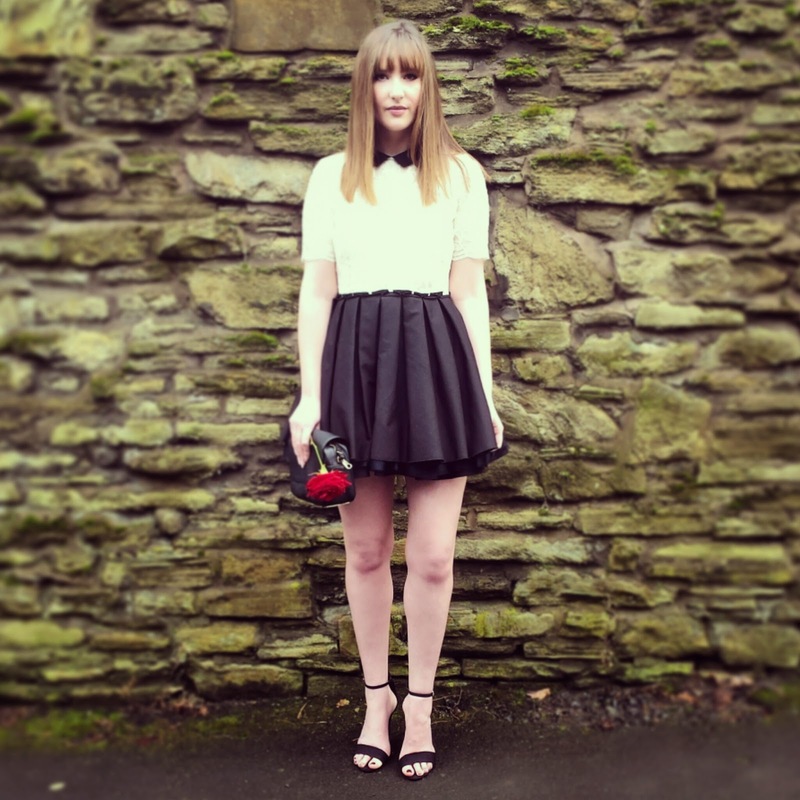 You can't beat a beautifully tailored white shirt. It goes perfectly with the pencil skirt, but you can easily dress it down with a pair of skinnies and flats. The accessories I've gone for add a bit of spice, to what could be quite a simple look.The animal print will always look beautiful and feminine when teamed with such a classic outfit, I just love it! It was love at first sight when I saw the fringed boots! Fringed accessories are a massive trend for this season, especially seventies inspired suede, these boots really do tick all the boxes! The next look is another mix of wardrobe staples. Polo-necks have been everywhere this past season, and they don't plan on leaving us any time soon. They instantly bring a look in to 2015, and add such a timeless elegance to any outfit. The beautiful monochrome trousers are perfect for going from a day to night look. They are incredibly flattering and add a 1960s vibe. To finish the look I added perfect black court shoes and a very on trend snake skin French Connection bag. For look three, I went with a more casual, everyday look. I absolutely love the colours that define this outfit. Such Spring Summer tones that instantly make you think of warm weather and relaxed times. 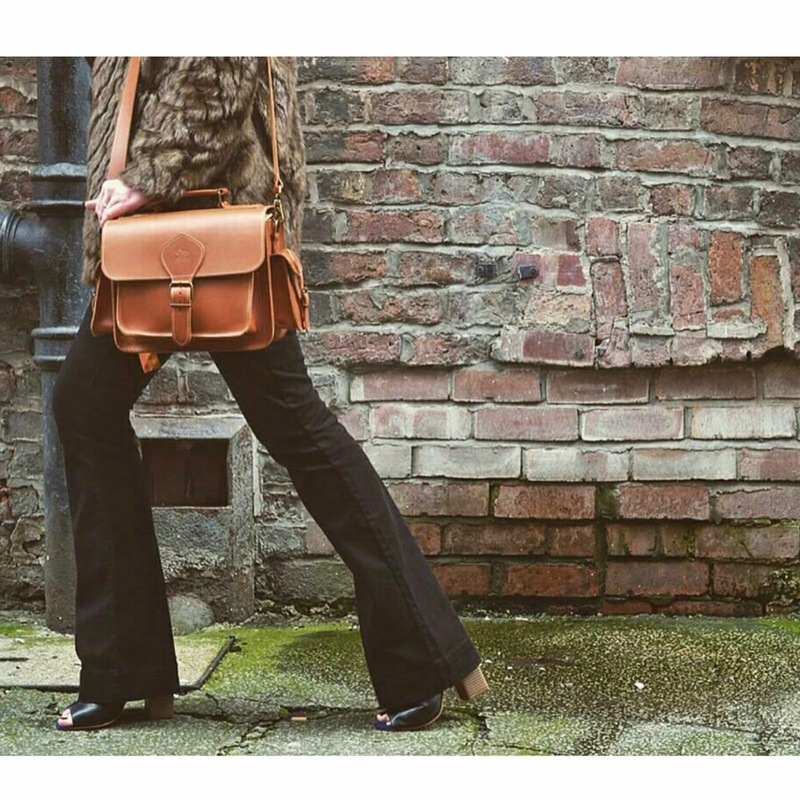 Oranges also happen to be big this season, reminiscent of the seventies with suede and snakeskin thrown in! Although I do love putting my heals on a dressing up, outfits like this are what you'll find me in almost every day. My final look embraces the double denim trend. If you had told me a few years ago that it would be stylish to rock double denim, I would never have believed you, but look at me now! I love the simplicity of the stunning denim dress, you could easily team it with tights and boots for colder days too. The French Connection jacket is an absolute must have! It is slightly fitted for the more feminine look, but oozes rock and roll glamour, pair it with black skinnies and an old t-shirt for the ultimate dressed down look. I stayed simple with the accessories with glam gold trainers and a cute backpack. I absolutely love Gemini-Woman. They cater for such a wide range of women, style and ages - there's something for everyone! Do check out their website, they also have some great inspiration and advice on choosing your perfect look. Happy Shopping! I've finally given in to fluff! Yes, that's right, not fur...fluff! Fluff is the new faux fur guys. It's everywhere and has been for a few months now. I have seen several variations on the highstreet, some are amazing; Topshop, Asos for example, and some look like massacred teddy bears (won't mention any names!). I finally found this beauty in the Next sale. I will of course link you to jackets you can get hold of, but I wanted to show you how versatile fluff can be. It's much lighter in both look and feel. It oozes femininity and grace, and wouldn't look out of place in Spring time. It's also fun, an aspect that all fashion should have! There are so many colours and textures embraced by fluff, that almost anyone, with any style can work with it; that's my favourite type of trend, one that is wearable and that everyone can love! 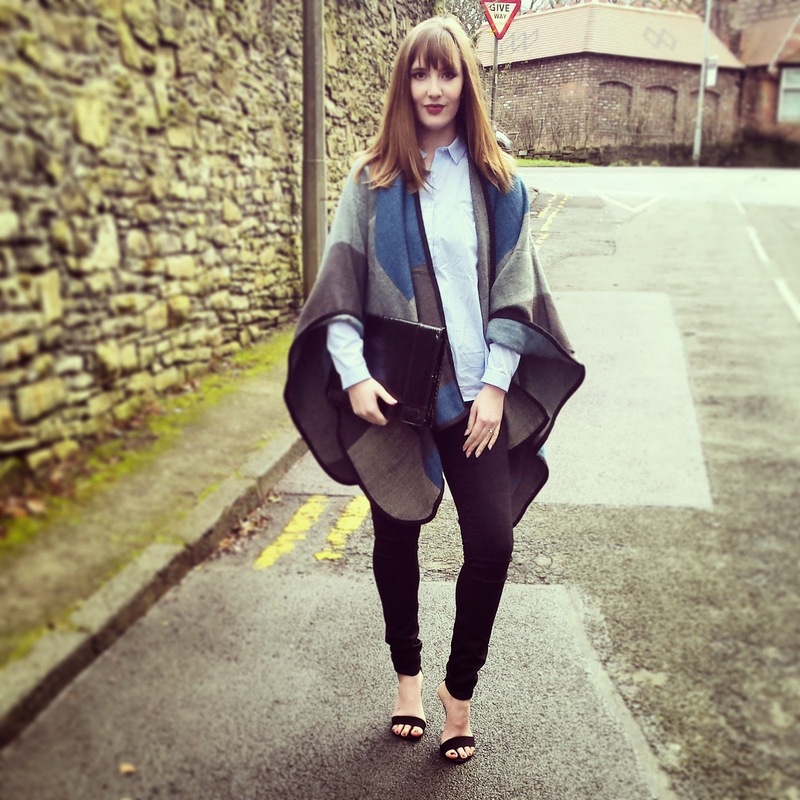 I teamed the jacket with the most flattering flares I have ever worn from asos, Personally, I love a good flare. There is definitely mixed feelings, and I'm aware that they do not flatter every shape. If you still want to embrace the seventies trend, I definitely recommend a printed shirt. There are literally 1000's of options, with every high street store embracing the bright bold prints for Spring. They are a nod to the trend, without looking like you're going out in fancy dress. 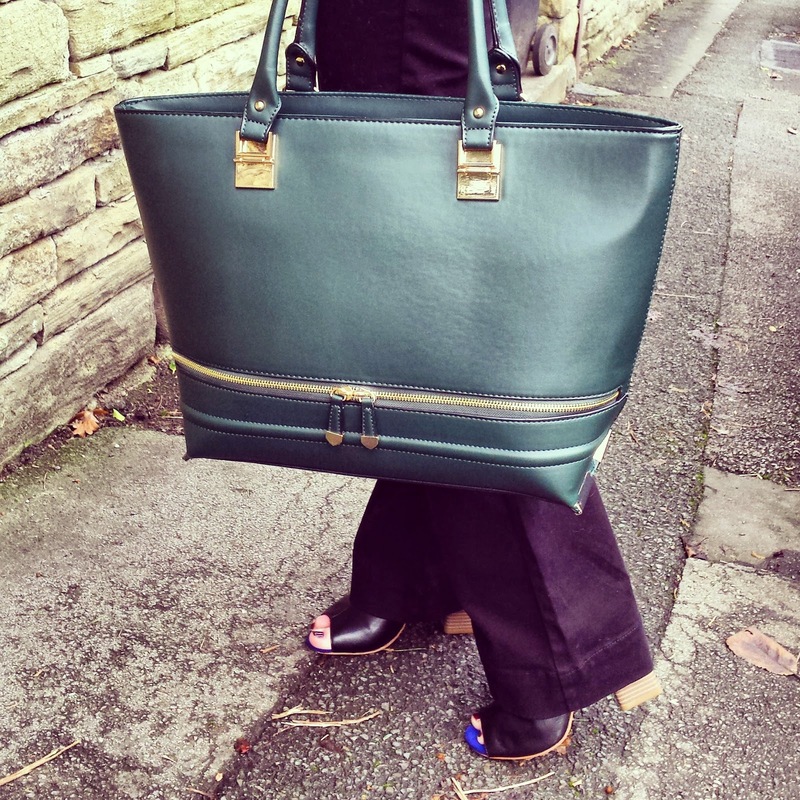 I finished the look with my trusty M&S mules which are still a staple in my wardrobe, and my New Look tote bag. How do you feel about fluff? Would you give it a go? 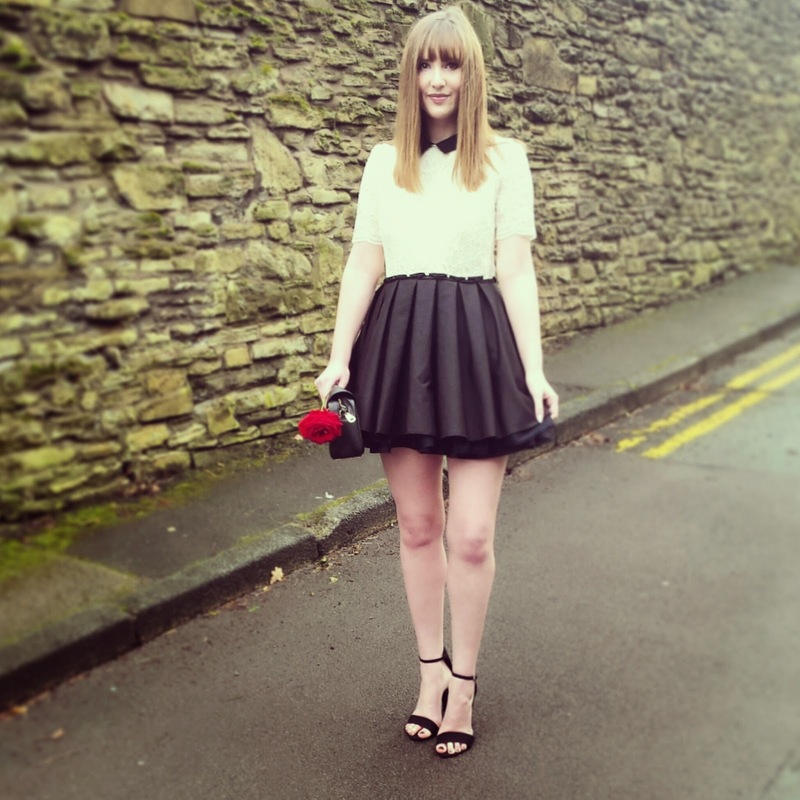 It's been a big hit on my instagram, but is it a wearable trend for you? Would love to hear from you! Hello and happy Friday guys! I don't normally update my blog on a Friday night, but I have so many new looks to show you, that I wanted to try and keep as up to date as possible! 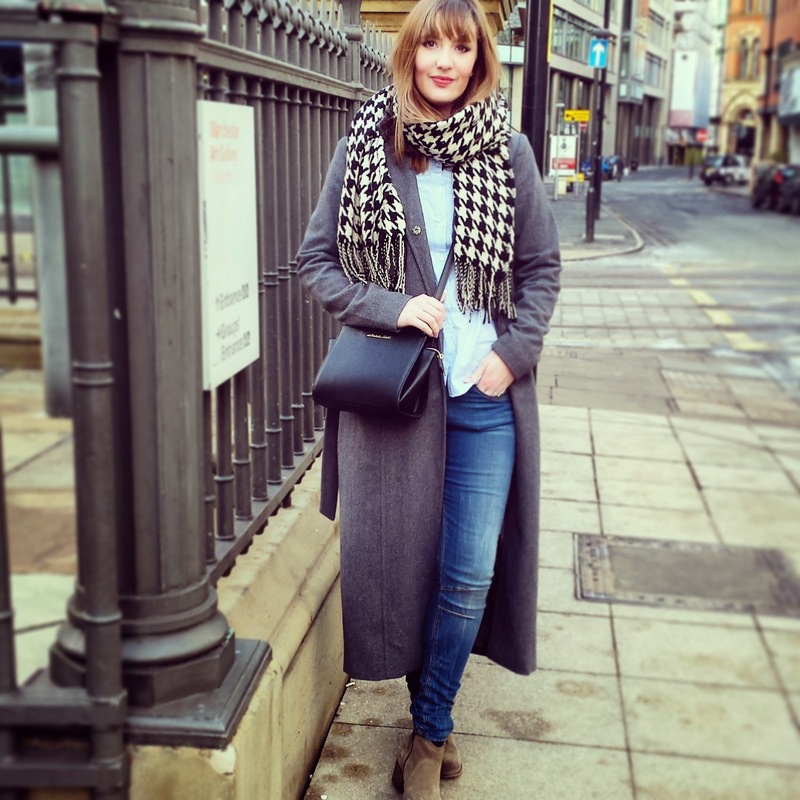 Just before Christmas, the lovely Amy from the Manchester brand, Grafea, emailed me to ask if I would like to collaborate and take part in a photo shoot with one of their amazing bags. Now if you aren't sure who Grafea are, you really need to check them out. 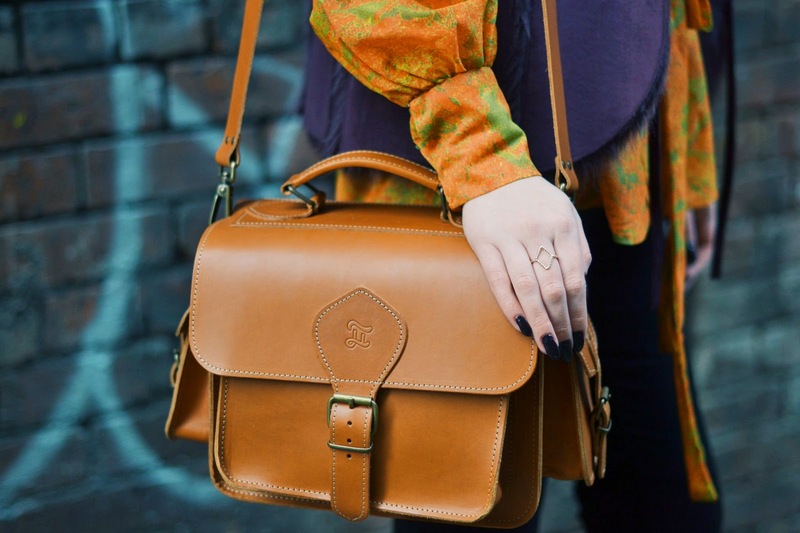 They are based here in Manchester and they make the most beautiful leather bags I have ever seen! They're most well known for their stunning backpacks (all over instagram right now) but they also create fantastic camera bags and satchels. I had admired their bags for months, so I obviously jumped at the chance! 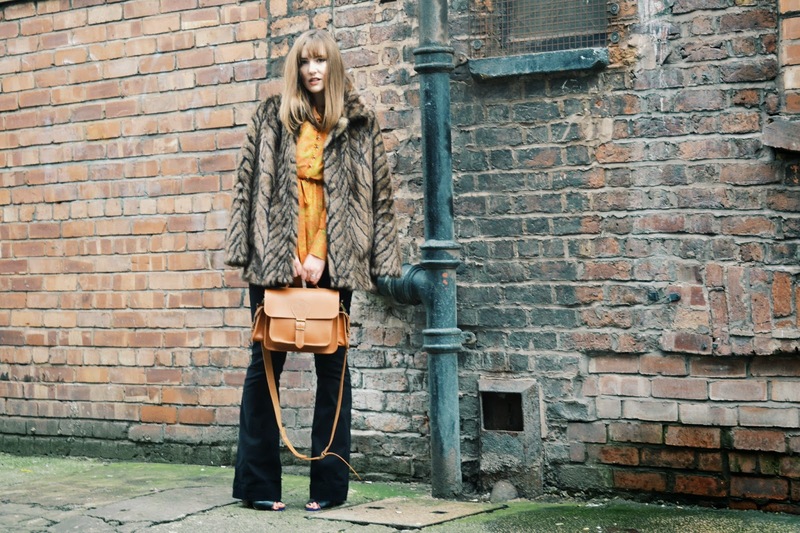 Amy had the idea of creating a seventies vibe with my shoot, which I thought was a fab idea, not only because seventies is a massive trend this year, but also because I love vintage and retro looks. Amy sent me over a mood board of her thoughts and ideas, and I started planning my look. 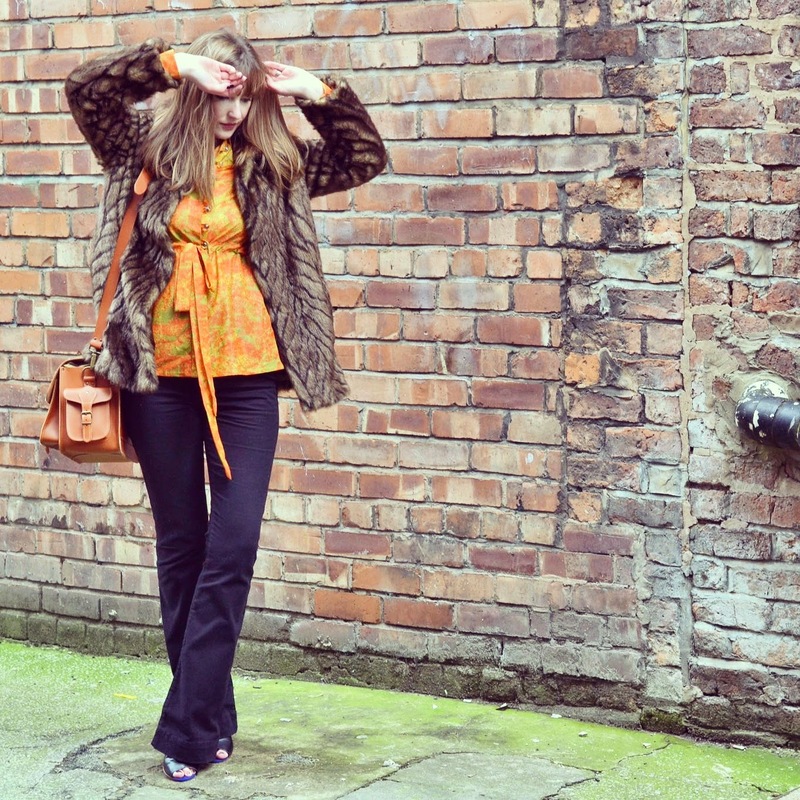 After a lot of deliberation, I finally decided on my black flares, vintage shirt and fur coat. 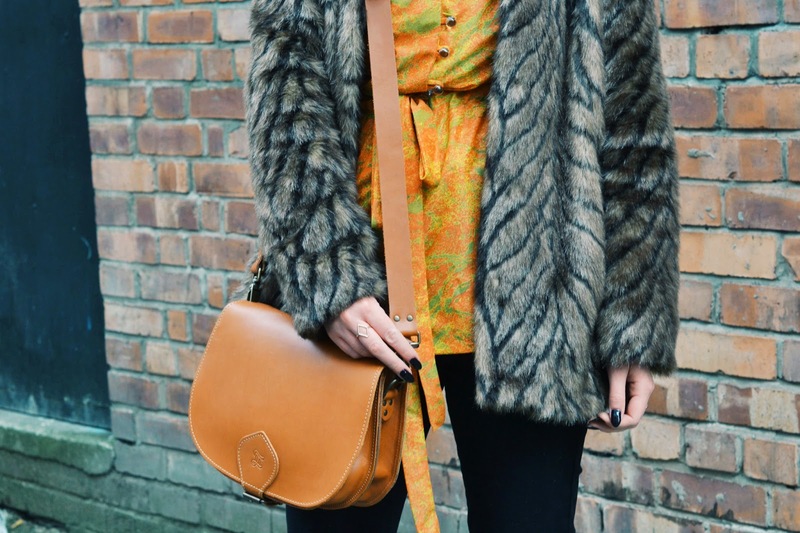 I also took a fur gillet which did make it into a few pics. The look is over-exaggerated and I love it! I wouldn't normally go so glam, but it fitted with the whole vibe and I felt like an extra from American Hustle! We shot the pics on a freeeeezing afternoon in the Northern Quarter. Luckily, I got to shoot with two of the bags, and I absolutely fell in love! Be sure to check them out! Have a great weekend, see you soon! Happy February guys! Yes, it's come around that quickly. One month of 2015 has been and gone, crazy right!? It's been a very busy month for me, good, but very busy. Hopefully I will have a more chilled Feb! So this look features some culottes that I'd been crushing on for literally months. They are from Zara and they are knitted! 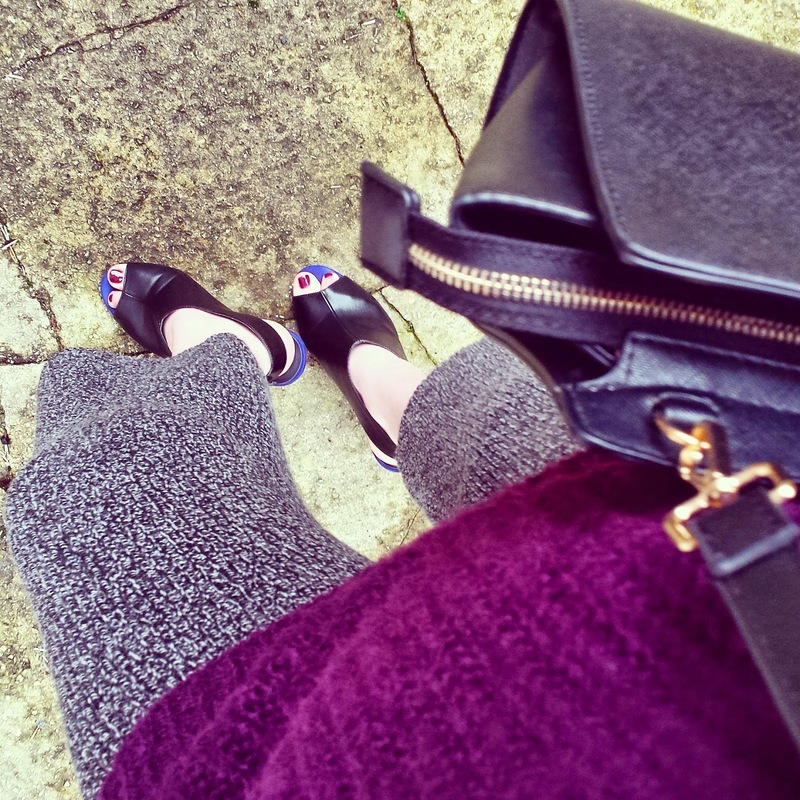 The knitted trouser trend was all over AW14 but I never had the confidence to buy any. Then I saw this pair. 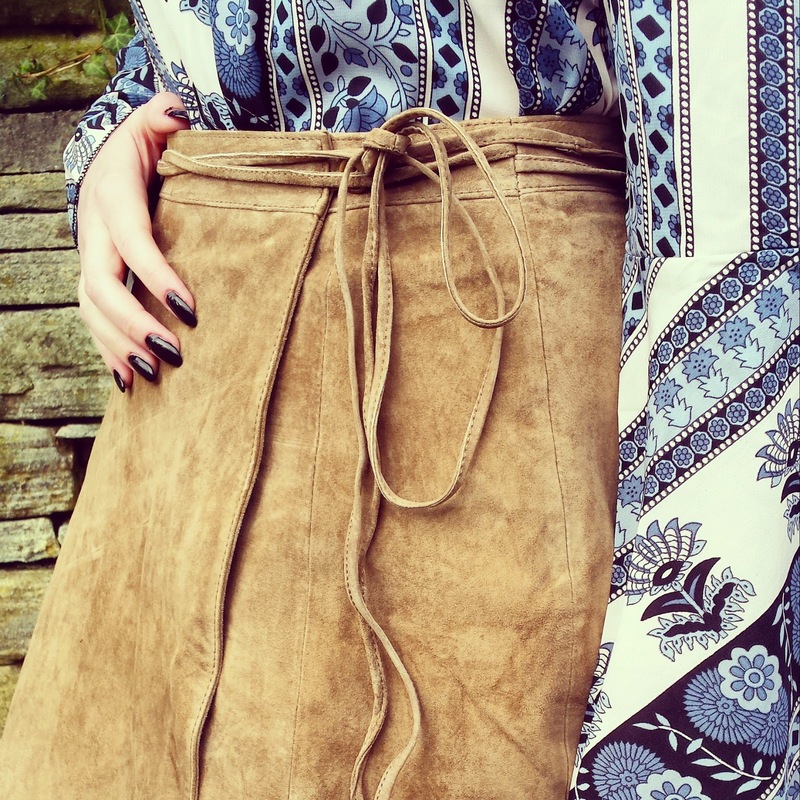 As they are culottes, they are much more flattering than a full length pair of trousers (which literally show every lump and bump on your entire body, however I've linked some flattering ones below). 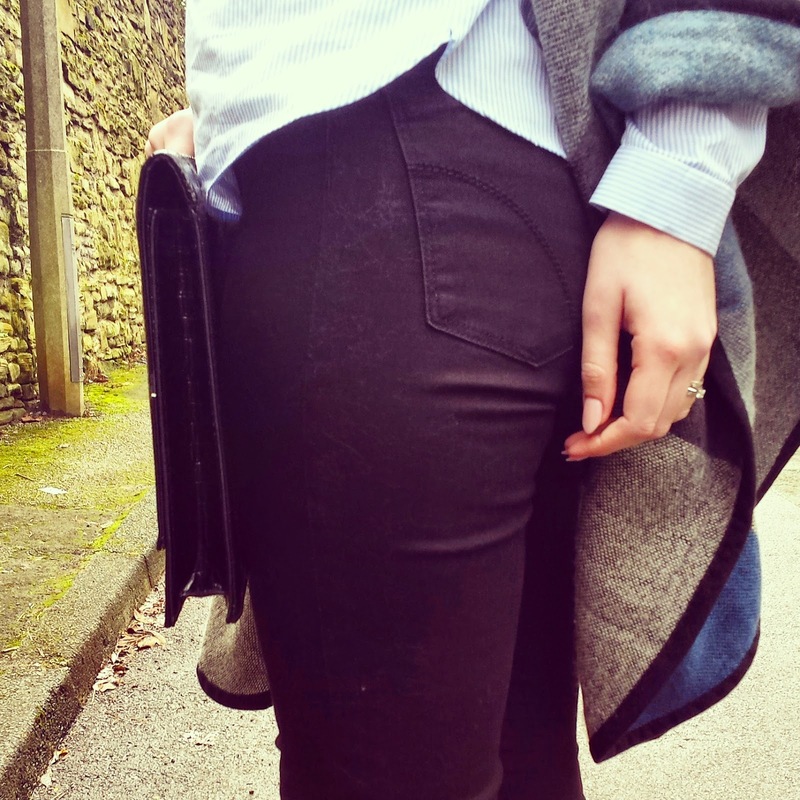 They are elasticated and definitely the comfiest trousers I have ever worn! I finally nabbed them in the sale for just £18.99. They are sold out, but I hope it gives you some inspo, as it's still going to be a big trend in SS15 so the high street will provide more options! The roll neck is a staple of mine. I wear it so often, it goes with anything, and it's really long, so looks great with leggings and boots. I finished the look with my hat, MK bag and *wear in nearly every post* mules. Have a great Sunday lovelies.